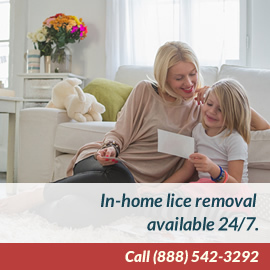 Have you ever gotten that dreaded call from your kids’ school saying: “Your child has head lice”? Well, I did. And I will never forget the day the school nurse called to tell me that my 7- year-old son was being sent home because he had head lice. It was very embarrassing for him and me-- and for his sister--who was also sent to the nurse for a head lice check. Although the nurse didn’t think my daughter had any lice, I was afraid the rest of the family could catch them from her brother. How to get rid of head lice?!?! I had no idea how to get rid of lice or even what head lice looked like. But, for sure, I had to find out how to get rid of head lice. Luckily, I remembered that my sister-in-law had used a company last year when she had to get rid of head lice on her kids. I called her, got the number for the “Lice Treatment Center” and called them immediately and asked if they could come to our house right away. Although their in-home service to get rid of lice wasn’t cheap, I honestly didn’t think twice about the cost because I was so panicked. I just wanted it done! The woman at the Lice Treatment Center who spoke with me promised to send one of their professional “lice technicians” to our house in about an hour. She said the technician would check all six us of us and would get rid of head lice on anybody who had them. The technician who came was so nice, so careful and so professional. She first explained the process she would use to get rid of the head lice. Then, she examined every hair on everyone’s head under a magnifying lamp. It took a while to check everyone one of us…my 3 girls, my son, my husband and me. The girls have long hair so they took the longest time to check. I was happy she only found lice on my 7-year-old son and then treated him to get rid of the lice. And even though he has fairly short hair it took about an hour to comb through each hair on his head and treat his scalp and hair with the treatment products. She said she used the company’s own products to get rid of head lice. I was relieved to find out the products were all-natural and non-toxic and safe for use on kids. They were formulated by the co-founder of the company who is a well-known pediatrician. That made me feel a lot better. And she said the company not only uses only its own all-natural products for the treatments, they also make several other all-natural products to prevent getting head lice again. Naturally, I bought some of the repellent products from her and have since ordered more from the Lice Treatment Center’s website. We use them every day! All I can say is thank goodness we caught my son’s lice in time before the whole family had them. And I am so glad I now know how to get rid of head lice: Call Lice Treatment Center! I never want to have to go through a head lice scare again.